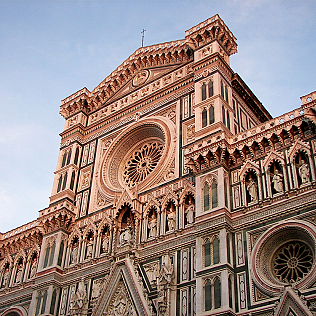 Santa Croce Basilica is the largest Franciscan church in Florence, situated in one of the most fascinating squares of the city. Very large and rectangular, it became the protagonist of festivals, shows, and popular games such as the famous \"calcio in costume\" (fancy-dress football) that still takes place here every June. In this sort of island formed by the two arms of the Arno River, in 1295 the Franciscans started building their church on the remains of a previous one, following the project of Arnolfo Di Cambio, and finished in 1443 with a Gothic facade. Impressive dimension and great mastepieces inside, as the cenotaph of Dante, the beautiful Annunciation by Donatello and the Crucifix by Cimabue, made Santa Croce become the grave of famous people like Michelangelo, Galileo Galilei, Niccolò Machiavelli (author of The Prince), the composer Rossini, the poet Ugo Foscolo and the tomb of Vittorio Alfieri made by Canova. It\'s worth visiting also the numerous chapels, the Bardi Chapel, the Pazzi Chapel, designed by Brunelleschi, the Baroncelli Chapel and many others, all painted by Giotto.